TigerAir Philippines is planning to increase its market share up to eight to ten percent in 2014 from the current five percent it holds domestically and the 3 percent it holds internationally. According to President & CEO, Olive Ramos, the airline is confident that it can attain such targets with huge opportunities to grow international market share with new upcoming destinations in Japan, China, and South Korea. Driven by aggressive expansion in domestic and international markets, the airline has already set its sights on flying to Japan as early as March 2014 with service initially to Narita and Kansai. She added that Tigerair will be expanding into China with new destinations including Shenzen and Macau. The airline recently revealed that it would launch direct flights between Shenzen and Kalibo in November. TigerAir Philippines is confident that it will be able to expand into South Korea in the future as well. In September, the airline launched a direct service between Manila and Phuket with twice weekly flights. Ramos says that passenger volume for 2013 is close to 200,000 which is nearly double the passenger volume of the previous year. In addition, the airline is targeting to double its revenues between P4 billion to P5 billion before the end of 2013, an increase from the P2 billion achieved in 2012. At present, the domestic market represents 55 percent of the company's total revenue while international flights account for 45 percent. "The thrust is to have equal focus on both domestic and international," said Ramos. TigerAir Philippines currently maintains two primary hubs at Ninoy Aquino International Airport Terminal 4 and Clark International Airport. The airline plans to resume operations to Davao with service from Manila scheduled to begin on December 2 after cancelling the route in July. The airline says that it is constrained from expanding to other local destinations with shorter runways as its fleet consists of only Airbus A320 and A319 aircraft. It is currently focused on increasing frequencies in Davao and Cebu. 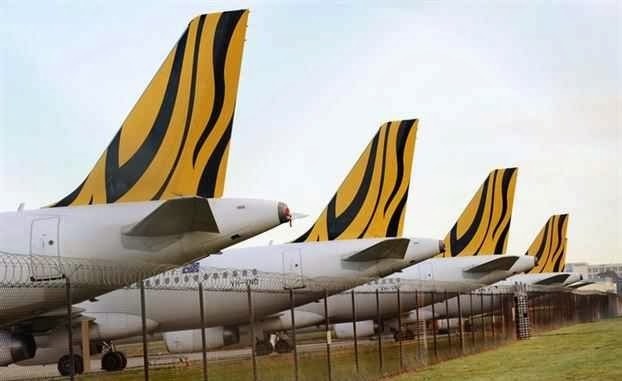 With just three A320 aircraft and two A319 aircraft currently operating TigerAir's Philippine network, the airline has set a target of increasing its fleet up to 25 aircraft in the next three years. TigerAir would like the Philippines to adopt a single airport system with Clark as the primary gateway as it can support the airline's expansion plans and growth in traffic. But that is unlikely given the industry's preference for a dual system with the potential of constructing a brand new gateway at a new location near Manila. Meanwhile, TigerAir Philippines is planning to raise its frequencies on its Kalibo-Singapore route from three to four times weekly beginning on December 2. However, the airline will be reducing its Clark-Hong Kong route from twelve to eleven flights weekly.